Thank you Amy Rutledge of WGN for visiting Ahlgrim Funeral Home in Palatine. Glad we can provide a fun community room for the public. Although it feels like 2018 just started (since it just did), February is only a few weeks away, which means Scout Sunday is just around the corner! Keep reading for the breakdown on Scout Sunday, Scout Sabbath, and Scout Jumuah in 2018, then head to Bryan on Scouting for an in-depth look at these upcoming BSA holidays and ways you can celebrate! Why: Scout Sunday always falls on the Sunday before February 8—the anniversary of the BSA! While Scout Sunday is officially on the calendar for February 4, charter organizations are encouraged to celebrate on whichever Sunday works best, such as the United Methodist Church, who will celebrate Scout Sunday 2018 on February 11. Be sure to check with your charter organization to find out when to celebrate. Why: Scout Sabbath, or Scout Shabbat, always falls on the Saturday after Scout Sunday. This year’s celebrations start on Friday, February 9 at sundown through Saturday, February 10. Similarly to Scout Sunday, charter partners may choose to celebrate Scout Sabbath at a different time. You can learn more about these dates from your council or your local Jewish Committee on Scouting. Why: The National Association of Muslim Americans on Scouting has marked Scout Jumuah for February 9, 2018, to celebrate Scouts and Scouters in the Muslim community. Of course, units may choose to observe this special day at another time that works best for them. Learn more about Scout Jumuah from the National Association of Muslim Americans on Scouting here to get a head start on planning your festivities! Head to Bryan’s full story to discover even more ways to celebrate, where to get your Scout Sunday, Scout Sabbath, and Scout Jumuah gear, and how to wear the patches. How will your unit celebrate this February? Share your favorite stories, tips, and ideas in the comments below! Send our troops and local veterans a little taste of home for the holidays. Ahlgrim Family Funeral Home is proud to be one of more than 800 exclusive Veterans & Family Memorial Care funeral home providers across America participating in the 10th annual VFMC Christmas Stocking for Soldiers & Veterans initiative. From now thru December 1st please stop in to the funeral home and pick-up a Free Christmas Stocking to take home, decorate and stuff with Christmas Cheer. You will receive a list of recommended items along with the free stocking. Bring your filled Stocking back at the Funeral Home between 9:00a.m. and 5:00p.m. weekdays and 10:00a.m. and 5:00p.m. weekends. 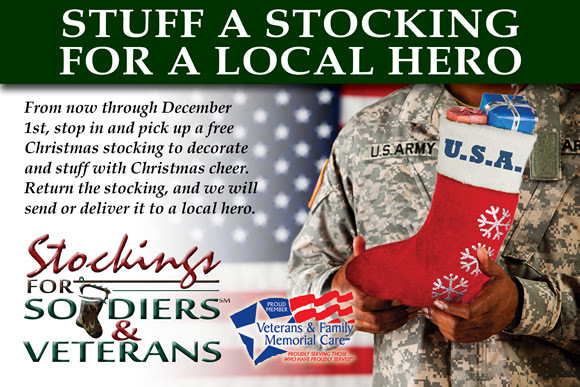 We will make sure your Christmas Stocking gets to a Veteran in plenty of time to be hung with care. Ahlgrim Family Funeral Services is Presenting a Life Saving Initiative to the Area. Vital ICE provides a platform on which to list your(and your dependent’s, if applicable) vital medicinal information, such as blood type, allergies, medications, medical history, ICE contacts, and much more. This information will then be readily available to EMS and other First Responders when they need it most. Please Download the App and Enter the Code 8871 to Start Using Today.